I used an oven proof plate with sides to bake this in. A pie plate would work great. Or an oblong casserole dish. Preheat oven to 350 degrees F. Spray a pie plate or another baking dish with low sides. I used an oven safe plate with sides. Slice zucchini, yellow squash, onions and tomatoes very thin. I use a mandolin. Arrange slices, alternately, in dish. 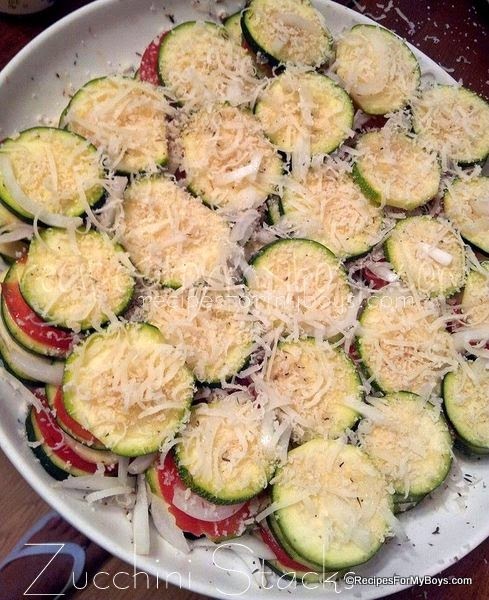 Zucchini, tomato, yellow squash, onion slivers, top with salt, thyme and pepper (if desired). Repeat. Drizzle olive oil over top and sprinkle with salt, thyme and pepper. Top with panko and freshly shredded parmesan. Bake in preheated oven 40 to 45 minutes or until lightly browned. Enjoy!